These writings of Swami Ramakrishnananda are for when you're are discouraged and unhappy. These writings of Swami Ramakrishnananda are for when you're are discouraged, tired of life, or just plain unhappy. The words of the author go straight to the heart. The booklet is available online for free from our online library. 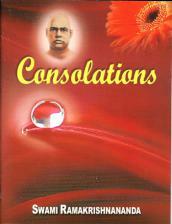 Swami Ramakrishananda’s Consolations is a spiritual first aid kit. While it can be read any time, the words have extraordinary power when you are faced with a down turn that might push you into depression. "Unless one passes through the school of adversity, one cannot properly be called a man. We learn much from our troubles." This is the kind of realistic advice Swami Ramakrishnananda gives in this 44 page booklet. These are from epistles or instructional letters. Although the text is available online, it is missing two items from the printed edition, a quotation from Swami Vivekananda praising Swami Ramakrishananda and a 3 page Forward written by Swami Shivananda in Benares in 1927. These were important to me. And another benefit from the printed edition only 3.5 inches by 5 inches is that it is easy to read as you lay depressed in bed.